…and why not? A wedding is as good a time as any to drink whisky says whisky afficionado Rosemary Moon. I did not include whisky in the drinks suggestions in my book A Banquest on a Budget but I think maybe I should have done! “I recently read a wonderful piece by a fellow whisky advocate, describing how she had used the opportunity of a wedding for some family bonding over a few bottles of her favourite drams. She and her nearest and dearest were staying the night before and so she selected a few favourite bottles to take along in order to lead a relaxed tasting throughout a social evening of catching up and enjoying each other’s company. It also allowed her to show what she really did for a living – tasting and appreciating and not just drinking. I thought that was great. I so often meet people who say that as a result of a whisky, at a very young age, at a wedding meant that they did not like whisky at all in later life. 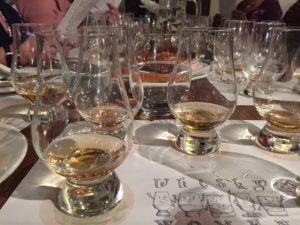 “It was strong and peaty and I never want to taste it again!” A whisky drinker, however, will happily enjoy most whiskies at a large gathering and, as with wines, you are unlikely to offer the most expansive options. You can make a really good impression by selecting a few whiskies that are not from the biggest distilleries or drinks companies, and which will introduce all your guests to the flavours of more modern whisky drinking. I am purposely ignoring the big name brands in my suggestions as most people know them and they are often too assertive, especially when you come to the smoky Islay whiskies. The downside of this is that you may have to search a little harder for them, although all will be available on-line from specialist whisky retailers. An all-year-round blend would be Monkey Shoulder from William Grant and Son. Attractively packaged with an art-deco-style monkey on the shoulder of the bottle, this is a blend of three great Speyside single malts including Glenfiddich, and very much represents the modern face of Speyside for easy drinking. It was created to appeal to the younger drinker and the cocktail market and it has quickly become a best-seller. A great cocktail base, it makes a good drink with soda or cranberry juice, a slice and ice to serve before a wedding breakfast. The name comes from the shoulder strain which often afflicted workers on the drying floor as they turned the grain over with scoops to assure an even processing of the grain after steeping. For a summer wedding you could try Asyla or Great King Street Artist’s Blend, both of which are from boutique blenders Compass Box. They are light, floral, summery and easy to drink as well as being complex enough to be interesting for people who love their whisky. Both could be served with crushed ice and cucumber and strawberry slices like a Pimm’s – but do not add the mint! Some scented geranium leaves or flowers would be far more appropriate, or a nasturtium or viola flower. Asyla is the slightly more vanilla of the two and more of an aperitif. The Artist Blend is a great whisky with food, especially of you are serving salmon, chicken or turkey. For a more traditional single malt I would suggest a whisky from Glengoyne, a distillery just north of Glasgow and one which prides itself on matching whiskies to food. For a summer wedding choose the 10yo which has plenty of character but is easy, light and sweet. The spiciness and pepper are fruitier than in most other whiskies, and it is like an updated recipe with a modern twist. I think it is a Peter Pan of a whisky – young and it should never grow up! For a wedding at a cooler time choose the 14yo or 15yo. Both of these have slightly deeper flavours as you would expect from the extra ageing in the barrel, with more pepper and spice, but they are clean and interesting, which would delight your whisky loving guests. It is at the end of an evening that most whisky lovers reach for a more peaty or smokey expression and this is when Islay whiskies are often set on the table. The classics, the readily available Laphroaigs and their like, whiskies that assault your nostrils as soon as the corks are pulled, are not the whiskies to serve to appeal to the widest possible number of your guests. Yes, stay with Islay but select a whisky that will get your guests chatting, even if only over the extra-ordinary colour of the bottle! My recommendation is The Classic Laddie from Bruichladdich, a distillery brought back to life by a couple of friends in the wine business and which has been pushing the boundaries of Scotch whisky production with the most exciting results. Bruichladdich is known for producing the most heavily peated whiskies in the world but the Classic Laddie is an easy drinking dram with a very light smoke indeed. Salty sea-spray mingles with rich fruits, hints of sweetness and cinnamon and the Laddie revamps the perceived image of Islay whiskies in an all-inclusive and very modern way. 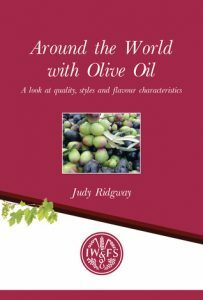 Rosemary is a real all-rounder in the food and drinks field. 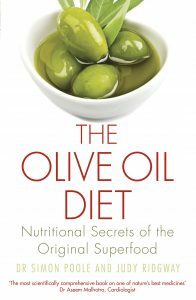 She writes great cookery books, develops lovely recipes and runs demonstration events for Mary Berry products among others. 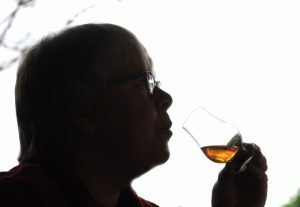 She has also set up Whisky for Women and organises regular events and tastings for members. And last, but by no means least, she produces podcasts and videos which are fun to listen to and watch.